What's the Business Impact of Game-Based Learning? We spend a lot of time talking about how game-based learning improves participation and engagement. But what kind of impact does it have on the business? As HR professionals and training managers, it’s an important question to be able to answer -- especially when you’re trying to secure a budget for a new program. Upper management wants to hear a solid business case. You have to be able to convince them that game-based training isn’t a waste of time (despite their preconceptions). That in fact, it’s cheaper, gets better results, and takes less time than traditional training. Here are some key points to cover. Employees this year spent an average of 53 hours in training, almost half of which were delivered via classroom training (1). With all the extra hours, you’d think that retention rates would be up, right? Traditional instructor-led training returned, on average, a retention rate of just 5 percent (2). That means that out of the 53 hours each employee spent in training, they only retained (and therefore use) a little more than 2 and a half hours worth. Think about how much money in lost productivity that costs your company every year if each employee wastes 50 hours of training. Game-based training programs achieve retention rates of over 70 percent with an average playtime of just 2 hours. I’m no Pillsbury, but that’s some serious dough you could be saving. Especially since people will not only spend less time away from their jobs, they’ll even participate in game-based training programs voluntarily outside of work hours. Yes, you read that right. Free training! Beyond efficacy, there are significant cost differences between game-based training and classroom training. For example, let’s imagine that you need to run a one day training course for 1000 employees. According to one provider’s website, the price of a full day instructor-led course for about 25 employees is around $5000 (3). That means to provide all 1000 of your employees with classroom training it would cost you about $200,000. Let’s not forget that classroom training also incurs costs like travel, hotel bookings, printing costs, food etc. That $200,000 is also just for one 8 hour training session. Employees this year spent an average of 53 hours in training (4). That means if you did all your training exclusively as instructor led, you could be spending up to $1,400 per employee over the course of a year. With 1000 employees, that’s $1.4 million in training! Game-based training on the other hand is much more scalable. The average cost of a game-based training platform is about $21-$38 per employee -- but can vary depending on the complexity of content and number of game modules you want to create. Assuming you still need to provide a one day training course for 1000 employees, an average game based training program would cost you about $38,000. That’s a savings of $162,000. Beyond achieving better results for less, game-based training programs also make it easy to measure success. A typical approach to prove ROI for both LMS eLearning and classroom training would be to test employees knowledge after the course had ended. If employees score well on the test, the training would be seen as successful. On the other hand, game-based learning platforms typically come equipped with an analytics portal that puts big data at your trainer’s fingertips. Having access to that kind of rich information lets you identify skill gaps while the course is still running, instead of assessing the efficacy at the end. Let’s say for example you’re running an information security course and decide to create an eLearning course in your LMS. In your LMS tracking you see all your employees have passed. Great news -- or so you think. What you might miss however is that while your employees passed, they also all got the questions about phishing emails wrong. The course would end and you’d expect your employees to be equipped to deal with phishing attacks. An assumption that could leave the company open to potential risk. But with a game-based training program you would be able to identify that skill gap and add new content to the training program while employees are taking the course. You could solve the problem before it has a chance to occur. Not to mention the deep analytics portal can be integrated with your internal systems to measure the business impact of training. So in the case of the security training program, you could track whether or not the program led to a reduction in security incidents -- allowing you to prove ROI beyond whether employees learned the content. Game-based training isn’t a fad, or a trend. It’s a strategy that top companies are adopting with great success. The benefits are numerous: it’s less expensive, get’s better results, and delivers a measurable ROI. Even in the unlikely case training results don’t improve, by adopting game-based training you’d still have reduced your upfront training costs by between 50-70% (5). There is literally nothing to lose -- and everything to gain. It’s time to stop replicating outdated training models and embrace a better way. A way that costs less and does more. A way that makes it easy to measure and track success. A way that supports how people learn instead of working against them. It’s time to stop throwing training money away and start achieving real results. It’s time to invest in game-based training. 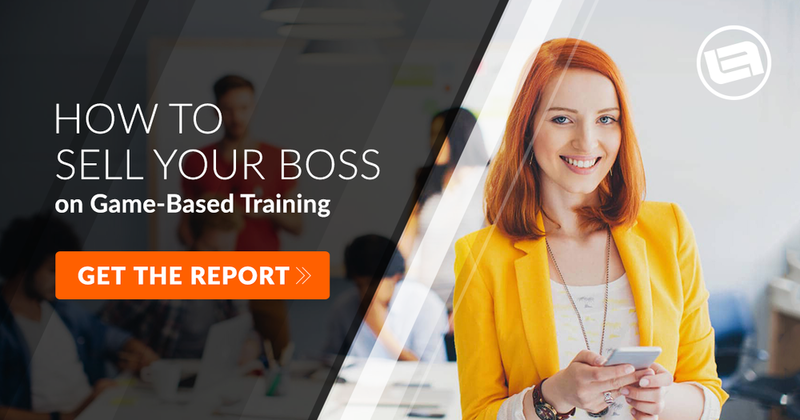 This article is an excerpt from our latest eBook: How to Sell Your Boss on Game-Based Training. To get access to the complete business case, including case studies and more, click here.